According to Forbes magazine 2009 will be remembered as the year that Tiger Woods became the first dollar billionaire in sport. That’s not bad going,is it? I don’t pretend for a moment â€“ and at this point my bank manager would nod forlornly â€“ to have any understanding of such things. Except to whistle quietly and say â€œa billionâ€ with some incredulity. In truth I’m surprised he hasn’t already surpassed that figure but I’m guessing Forbes have based their calculations on earnings that can be traced directly to his day job. 20 or 30 years ago people would have found it mind boggling that a sportsman â€“ still very active in his sport â€“ could crack the billion mark. If you’d told them a golfer would do it they would have written you off as a crackpot. But all of that was before Tiger. He has not just rewritten golf’s script he has changed the face of sport. Nike had already had success with endorsements before Tiger but the deal they pulled off with the young Woods has no parallel. He has become the company’s biggest star and, given Nike’s global pull, that makes him the brightest star in the sporting galaxy. It is, after all, only money so what does it all mean for golf? I’ve always been of the opinion that Tiger is nothing but a good thing. Yes, it can be boring if he wins all the time and his sullenness can be annoying. But his very attitude, the swearing and club throwing, the monosyllabic press conferences, the early morning practices, proves that the competitive spirit remains unsullied by the gigantic fortune. If nothing else that is a measure of the huge desire of the man to be the very best in golf. Think about the sheer spirit that it must take to sit with close to a billion dollars in the bank and still put in the hard hours to rebuild your game and fitness after major surgery. I find something admirable in that, in the way his obsessive need to win has remained undiluted. It’s a common complaint that golfers now earn so much money that their desire is blunted, they’re happy to cruise along knowing that a couple of good rounds here, a strong back nine there will keep the mortgage on all three houses paid for a good few years. If that is the case then they should take a look at the man they are chasing, a man who could pay the mortgage on a small European country, and be ashamed. He beats them because he’s better than them yes. But he also beats them because he works harder than most of them. That is the key to unlocking true greatness. So right now Tiger is doing alright by golf and golf is doing alright by him. Globally the game is exploding and in many places it is doing that on the back of Tiger. That’s a good thing but it needs to reap rewards. Young talents need to be found and nurtured. Because at some point Tiger is going to retire to spend more time with his money. At the moment that would leave a gaping hole. Those though are worries for the future. In the meantime we’ll just need to sit back as Tiger Woods Inc. adds yet more dollars by playing the most amazing golf we’re ever likely to see. 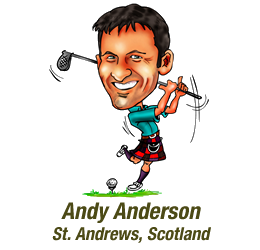 Andy, your story is well written re Billions of earnings by Tiger. On the other side there are a lot of youth from around the world who see Tiger as a role model and look up to him and see that to achieve what Tiger has achieved was not handed to him on a platter. It took hard work and long hours practicing and having the right people around him who believed in him. Many of today’s youth give up early on their dream and put it in the too hard basket. Also very little mention is ever given in newspaper reports as to what Tiger does as a Philanthropist with his schools, educating the underprivileged and the would be achievers who need help to achieve their dreams. I am sure there are many other areas of people’s lives Tiger has changed for the better but he never speaks about it. Tiger has been given a gift in his Professional golf and this allows him to share a dream with others not so fortunate. Keep up the stories I love reading them.